Colleen Oakley grew up in the upstate and recently held a launch party for her first novel, Before I Go at Fiction Addiction. I was thrilled to see a large turnout and happy to see many of Colleen’s high school friends in attendance. Colleen’s mother was in attendance as well – she’s accompanying Colleen on her book tour since she’s pregnant with twins. In her role as a journalist, Colleen has written for publications including Ladies Home Journal, Fitness, and The New York Times. 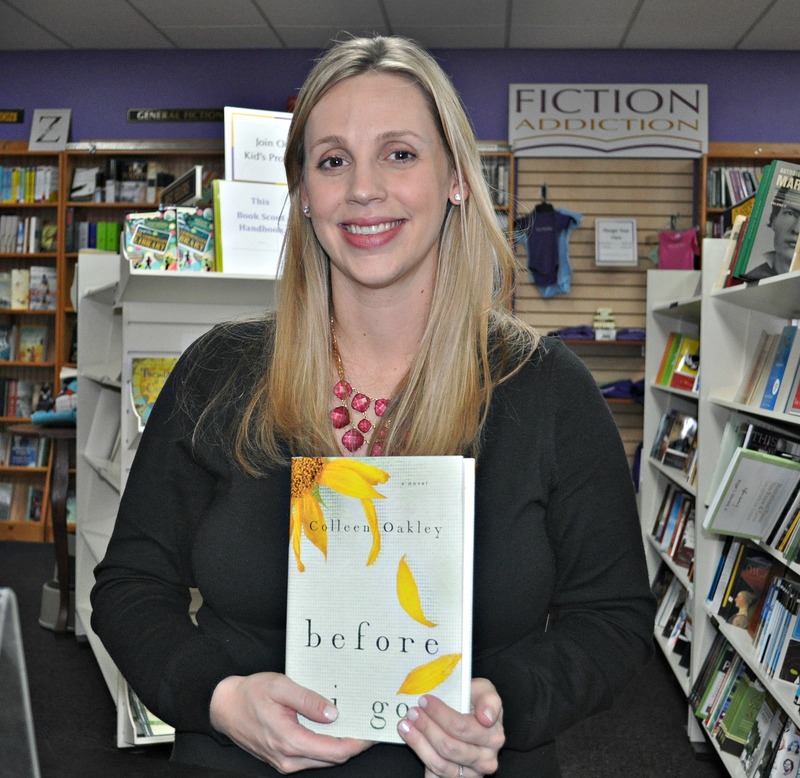 Her first novel, Before I Go, was published in January to great reviews. A few people at the launch had already read the book – they loved it and said it made them cry. I asked Colleen if she cried when she wrote it and she said that one scene did make her cry, so be sure to have tissues handy when you read this book. Colleen lives in Atlanta with her husband and children and is currently working on her second novel. A heart-wrenching debut novel in the bestselling tradition of P.S. I Love You about a young woman with breast cancer who undertakes a mission to find a new wife for her husband before she passes away.Twenty-seven-year-old Daisy already beat breast cancer three years ago. How can this be happening to her again? I got Colleen to autograph a copy of Before I Go for one lucky reader. To enter to win an autographed copy of BEFORE I GO, simply fill out the entry form. Contest is open worldwide – one entry per person, please. I will use random.org to determine the winner. Contest ends at midnight EDT Thursday, February 12, 2015. Comments are welcome (and appreciated) but will not get you an entry in the contest. Sounds like a good premise, but these kinds of books are difficult to read! Sounds similar in plot to others, but I think I would like it. Enjoyed hearing about the author visit too! I would like to read this one but I am also super nervous about reading it. The premise sounds very sad! This sounds like a very emotional book. This looks like a sweet read, how fun to attend her launch party! I just read an interview that Colleen did on another blog. Love the sound of this book. Glad to got to see her at the event. I really loved this book. How fun you were able to meet her!! The book sounds very touching. I will add your giveaway to my blog’s sidebar. Having just lost an aunt to stage 4 breast cancer last year, I need to read this. Thank you for the chance. It’s such a tough topic to read about. I already have a copy, so good luck to all who enter the giveaway. No way I could read this right now. I need more laughs, less tears! Sounds like a great event! I’ve heard really good things about this book. Thanks for the giveaway. I’m pretty sure I have this one… or at least I think I do. I’ll be prepared for a tearjerker. I’ve seen this one around but I don’t believe I’m quite brave enough to read it. I do love that her mother is traveling with her on the tour ~ that’s so sweet!